Baye Laye is an ordinary Senegalese fisherman, who dreams of a better life for his family. When his brother Abou decides to immigrate to Europe, Baye Laye is reluctantly persuaded to embark on the dangerous journey. 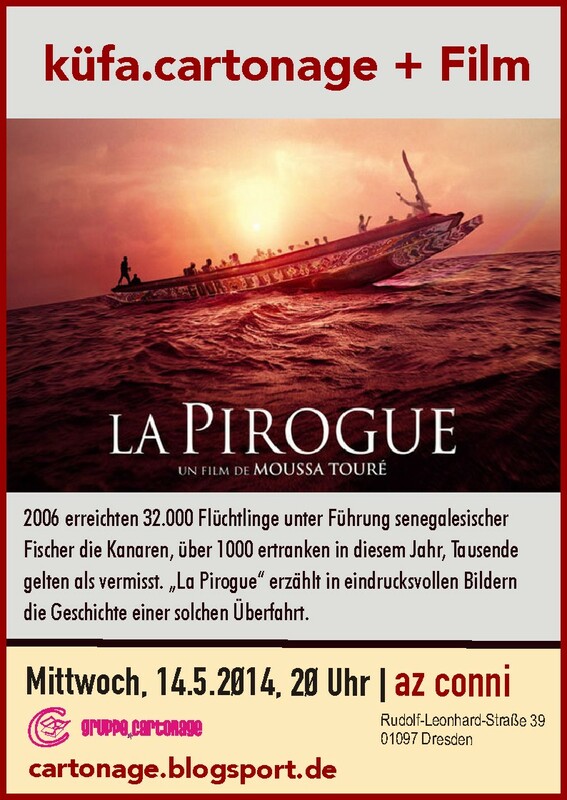 As the captain of a Piroge, a fishing boat, he tries to land 30 people into the Canaries. Each of them dreaming of a new beginning, as a football player, musician or farm worker. However, only Baye Laye knows about the dangers of the sea. This film draws an emotional portrait of the treacherous journey that costs thousands of peoples life, while trying to immigrate “illegally” to the hermetically sealed world of the European Union. Vor dem politischen Dessert gibt es wie immer leckeres veganes Essen. Wer mit­ko­chen möch­te, ist ab 18 Uhr in der Küche des AZ Conni herz­lich will­kom­men! Du browst gerade in den Cartonage News Weblog-Archiven nach dem Monat April 2014.